Recreation, by its varied nature of services, poses unique challenges in achieving program access. On any given Saturday, a city’s residents may be taking water aerobics classes at the local recreation center, walking on a hiking trail, participating in youth soccer leagues, fishing, enjoying a picnic, or just hanging out with the kids at a neighborhood park. This myriad of activities must all be accessible to people with disabilities as part of the “program access” obligation of public entities under Title II of the ADA. How does a public entity meet this obligation? The best way is to have all facilities, equipment, and outdoor areas fully compliant with accessibility standards. In the real world, however, this isn't always the case. Limited budgets, lack of resources, and technical infeasibility can make bringing existing facilities and equipment into compliance difficult, if not impossible. The ADA regulations provide flexibility for this reality by providing exceptions for actions that cause “undue hardship.” Public entities are also not required to take actions that change the “fundamental nature” of an activity or service. There is no exemption, however, for the obligation to provide program access to individuals with disabilities. This obligation is more than just “getting people in the door.” Program Access requires that use of facilities and services be equal to what other individuals receive, and it must be provided in an integrated setting with other members of the community. The following scenarios illustrate “fundamental nature of the program,” “integrated setting,” and “undue hardship” along with different solutions to providing program access. Ben, a pre-teen with Down’s Syndrome, has signed up to take swimming lessons with other children his age at the city’s swimming pool. He already knows how to swim and wants to advance his skills. The recreation department tells his family that an adaptive program is available at a different time for children with disabilities. Response: Unless there is a significant health or safety threat, Ben should be allowed to participate in the class with other children his age as program access requires providing services in an integrated setting to the fullest extent possible. A community has decided to start a wheelchair basketball team. Some members of the recreation department have expressed concern that providing a separate basketball program limited to wheelchair users would be discriminatory, are they right? Response: No. Public entities can offer separate programs when separate measuresare necessary to provide equal access to an activity. For instance, in order for individuals with disabilities to have the opportunity to play team sports, the best way to provide equal access to that type of opportunity may be a separate league for wheelchair basketball. Sunny College has developed a mountain bike trail that is very popular. The college has received a complaint that the trail is not accessible to students with disabilities as the terrain is very rugged and hilly. Response: In this case, changing the terrain of the trail would change the fundamental nature of the program, which is to provide a mountain bike experience to the user. 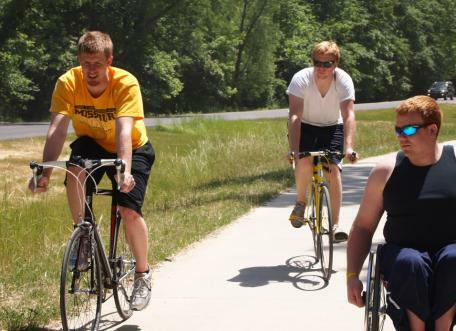 However, if a student with a disability had a mountain bike with adapted features, the student should be permitted to use the trail just like any other student. Anytown has four parks with large grassy areas and playground equipment. Each summer, the city offers a two week day camp with structured outdoor activities at the largest and oldest park. The park has a somewhat steep incline from the parking lot and the restrooms are not accessible. They have budgeted a complete renovation of the park, but this will not occur until the next year. Response: Anytown does not wait to find out if any children or family members will need access to the day camp program. Instead, it makes the decision to temporarily move the day camp program to a smaller, accessible park as the reduced size will not affect the program. Smallville only has one pool and it is always filled to capacity. Smallville would like to open another pool but financial constraints make this impossible. The pool is required to have two means of accessible entry, one being a pool lift. The pool presently has a sloped entry. Smallville is hesitant to install a permanent fixed pool lift because the space is needed during swim meets and other functions. Response:Smallville decides to buy a portable pool lift that can be securely fastened in place during pool hours but which can also be moved to make more space during swim meets. (Note: if an individual needed a pool lift during a swim meet, the lift would still be provided). Apple City’s recreation center is located in an older two-story building. The first floor has a basketball court and some side rooms. The second floor houses exercise equipment. They have received numerous complaints that there is no way for someone with a mobility impairment to use the exercise equipment without an elevator. Apple City’s budget is limited and the elevator expense is viewed as prohibitive. There are also structural difficulties in installing an elevator. Response: Installing an elevator is legitimately an undue burden at this time. The city decides to put some standard and adapted exercise equipment in the side rooms on the first floor. Although not a permanent or optimal solution, this allows individuals with disabilities to exercise with family and friends. The city also begins a long-range plan to move recreation facilities to another location.